GANNICOX HOUSE is one of the historic buildings in Stroud. It started off as a modest weaver's cottage, built around 1650. 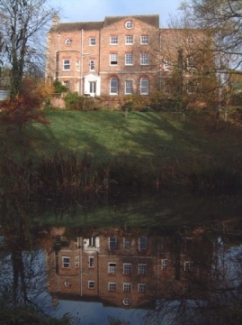 With the arrival of mechanised textile manufacturing Gannicox was built into the present substantial mansion around 1750, incorporating the old cottage. It was built as the home of the entrepreneur who owned the textile mill to the south of Gannicox' grounds; today this mill - now Millikan Textiles - produces world class tennis balls and pool table cloth. Gannicox changed hands and purpose many times over the centuries. Between 1950 and 1980 it was a nursing home, incorporated one of the first anthroposophical medical NHS practices in the country. The NHS practice has now closed, but a range of anthroposophical therapies continue to be available at St Luke's Therapy Centre. Some 20 years ago Gannicox developed into the current Camphill life-sharing community with St Luke's Therapy Centre next door. The house with its outbuildings also incorporates the Sunlands Waldorf Kindergarten. Gannicox House has recently undergone a major renovation and refurbishment project, enabled through a generous legacy.